The auction, which is divided into two sessions, will commence at 12 noon sharp for the early session in the Harbour Hotel, New Dock Road, Galway, with registration open from 11am. The afternoon session, which is dominated by Galway city and county properties, will commence at 3pm . The auction, which is streamed by Brandt Studios, can be viewed by visiting O’Donnellan & Joyce’s website www.odonnjoyce.com/auction from the comfort of your own home or office, anywhere in the world. The early session starts at 12 noon with the following properties, listed in no particular order. Ground floor public house with full seven-day licence in place (currently known as Keegan’s Pub ) with overhead living accommodation. Being sold with tenant in place. Four bed duplex apartment in student village serviced with a reception office, onsite laundry, and security. This development is used solely for student accommodation during the academic year. Two two-bed mid terrace townhouses, ideally located in the heart of the thriving town of Ballinasloe. The management fees are €1,200 pa. Agricultural land of approximately 17 acres on folio number RN32247F. Close to the village of Whitehall with an AMV of €60,000 and 6.6 acres of land for sale on Folio Number RN33106F with an AMV of €25,000. Three four-bed semidetached houses being sold as separate lots. Located within walking distance of Ballymote village. Off street parking and private rear garden. AMV: €45,000 each for Nos 12 and 23m €30,000 for No 38. Two bed apartment being sold with vacant possession. Located within walking distance of all amenities of Limerick city. Three sites located within The Hawthorns housing estate. Development potential subject to planning permission. Folio Map LK54854F. Two modern three bed semidetached homes for sale separately. Would make great starter homes or investment properties. Two semidetached two bed townhouses for sale in separate lots. Close to Briarhill Shopping Centre, Galway Clinic, and Merlin Park Hospital. No 62 is being sold with tenants in place and No 103 has vacant possession. Two semidetached two bed townhouses for sale in separate lots in the same estate as previous units mentioned. No 51 is being sold with tenants in place and No 50 has vacant possession. Three two-bed apartments for auction separately. Being sold with tenants in place. Close to all amenities of the busy market town of Gort, with its bars, restaurants, and shops and just off the M18 Limerick to Galway motorway. Located in the heart of Oranmore, this modern two bed first floor apartment has ample car parking. Excellent investment due to the demand for rented properties in this locality. The property is being sold with tenants in place. Two bed third floor apartment being sold with tenants in place. Situated on the riverside and within walking distance of the town centre in a central and convenient location for all local amenities. Two four-bed semidetached houses with nine adjoining serviced sites with previous planning. One house is fully completed and in good condition. The second property is completed to a builder’s finish and requires completion works. Two bed apartment being sold with vacant possession within 3km of Bundoran and approximately 30km north of Sligo town. Two bed third floor apartment currently rented and being sold with tenants in place. Rental income €400 per month, tenants in situ for approximately three years. Agricultural lands of approximately 16 acres with extensive road frontage. The lands are located on the main Loughrea - Woodford road (R351 ) and within 15km of Loughrea town. Two partially completed houses on approximately 1.5 acre site. Both houses are four bedroom dormers. This site previously contained planning for four houses. Folio number LK15135. End of terrace property over three floors. Ground floor bar fully licensed but not trading. Two floors of residential accommodation overhead require total upgrading. Land of approximately 0.9 acre off N84 Ballinrobe/Galway Road. Good quality agricultural land. Development potential subject to planning. Folio MY58682F. Detached four bed bungalow standing on a site of circa 0.5 acre. Situated between Ballyhaunis and Ballaghaderreen. Just off R293 and only 15 minutes to Knock Airport. Detached eight bed residence previously used as a B&B with its own swimming pool. Spacious living accommodation and ample car parking spaces within walking distance of Sligo town and all amenities. Land of approximately 2.5 acres with possible development potential. Contains superb sea views. Will not be sold subject to planning permission. Folio MY44347F. Land of approximately 14.5 acres to the rear of Brooklawn housing estate. Only 10 minutes’ drive to O’Connell Street in Limerick city centre. Commercial premises which comprises a single storey premises with flat roof. Currently operating as a Gala grocery store and has a petrol forecourt with Top Oil franchise. Being sold with tenant in place. Former bar/restaurant ideally situated in the centre of Headford, only 25 minutes from Galway city and 15 minutes from Ballinrobe. Downstairs features the restaurant and pub with toilets, kitchen, and storage rooms. Upstairs has three bedrooms, bathroom and a sitting room, access is through the pub. The public licence has expired. Corner unit with two commercial retails shops, one is currently occupied by Print Shop and is being sold with the tenant in place while the other is vacant. Both units have vacant overhead accommodation and are in need of refurbishment. To the rear of the building there are another two townhouses and a yard. Both properties and yard are currently let and are being sold with tenants in place. Site of approximately 0.142 hectare (0.35 acre ) with small unit. Stone faced front wall bounds the site. Fronting onto N65 and short walk to village centre. Loughrea and Ballinasloe (M6 motorway ) are 20 minutes’ drive. On folio GY91947F. Development site of approximately 1.1 acres with two derelict buildings. Fronting onto the R348 Gort to Ennis road. Folio No. GY30892. Fantastic two bed fourth floor apartment presented in excellent condition. Close to the many amenities of Salthill. Only a leisurely stroll to Galway city centre. Being sold with vacant possession. For sale in one lot. No 18 is a ground floor retail unit two/three bedroom duplex apartment overhead. No 19 is a ground floor retail unit one bed spacious duplex apartment overhead. Steel Frame warehouse approximately 607sq m on a large site close to the village of Lissycasey and only 20km from Ennis. Located just off the N68. Property is currently vacant. Folio CE45005F. Two bed mid-terrace townhouse, one bathroom and very generous living space with lovely sun trap to the rear which is totally private. This property would provide the ultimate investment or starter home or would be ideal for someone who is looking to downsize. Wonderful four bed detached property presented in turnkey condition with a large front garden providing off street parking and side access to the rear paved garden. Ideally located within moments of Westside Shopping centre, Aldi, and a host of schools and sporting facilities. Only six minutes’ drive to Salthill Promenade. Mid terrace three bed house presented in good condition. The property benefits from high ceilings, PVC double glazed windows, while outside offers a garden at the rear with decking and a seating area. Shantalla is a strong residential community offering local amenities, being within close proximity to NUIG, UHG, and Galway city centre, while also within a short stroll of Galway’s vibrant west end, offering a variety of excellent restaurants and bars. A fine five bed semidetached property located across the road from UHG, only five minutes from NUIG and within walking distance of the city centre and all amenities. The property is presented in very good condition and enjoys off street parking to the front and a good sized garden with shed to the rear. This house is for sale fully furnished. Site of approximately 2.37 acres accommodating former dance hall known as The Ranch House. Folio GY32602F. This lovely three bed semi has always been owner occupied. An executor sale, it has all the hallmarks of a property that was well looked after and meticulously maintained. Walking distance of NUIG, UHG, Dangan Sports complex, and all other amenities. Three bed townhouse 10 minutes’ drive from Galway city centre and accessible via various public transport routes. The property is split over two floors with bedrooms on the second floor and living areas plus one bedroom on the first floor. Ideal starter home or investment property given its proximity to Ballybrit and Parkmore. Unique, detached three bed home located in a secluded sylvan setting, on approximately 0.9 acre mature site and having been recently extended, refurbished, and modernised. Lovely family home, located in the much sought after area of Ballynastaig. End of terrace four bed house overlooking the green space and situated in a well maintained residential development. Ideal purchase for owner occupiers or investment interest. There is off street parking to the front of this property, enough to accommodate two or three cars. Presented in excellent condition and maintained to the highest standard, this superb three bed owner occupied home is the answer for those who are looking for a home within a stone’s throw of the city centre and all amenities. Close to Headford Road retail park and Eyre Square but tucked away in a quiet street, this property has excellent rental potential. Two bed first floor apartment in excellent condition. Very close to Salthill Promenade and within walking distance of the city centre, whilst benefiting from all local amenities. Ideal for a variety of buyers, including first-time buyers, investors and retirees looking to downsize. Located in a quiet residential cul-de-sac where properties do not come to the market too often, this very attractive four bed family home is presented in excellent condition and is within walking distance of the town. This large site measuring 70ft x 175ft or approximately 0.28 acre, with mature south facing rear gardens, offers a discerning purchaser an abundance of space both inside and out. Comes with an integral garage which could be suitable for conversion. City centre terraced property within walking distance of Eyre Square and across the street from the Town Hall Theatre. Owner occupied for many years and oozes with character, retaining many of its original features. It enjoys its own private rear south facing patio area and has access to a shared garden that is exclusively for the residents of the houses on that strip. Four bed end of terrace house with rear garden area and good sized lawn accommodating patio area and mature trees. Located to the rear of the g Hotel, Eye Cinema, and Wellpark Retail Park. Part of GMIT campus at Cluain Mhuire with Galway Film Centre on site is just two minutes’ walk away. A great location, only 1.5km to Eyre Square. A beautiful semidetached four bed home presented in excellent condition by the current owners. The ground floor playroom with shower room could be changed to a fifth bedroom. A large paved driveway to the front of the property, allows access for four cars comfortably. 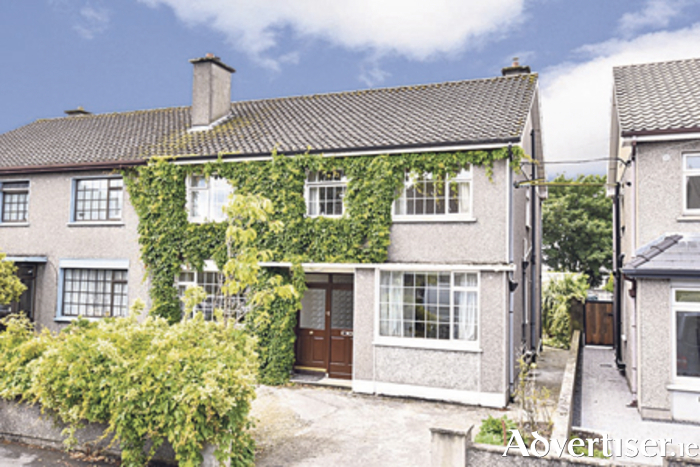 Offering a quiet, tree-lined street filled with residential dwellings, all just around the corner from NUIG and UHG. Within walking distance of Galway city centre. Situated at the rear of No 17 Newcastle Park, this a charming two bedroom bungalow has a separate, private front garden and a sizeable rear yard, an ideal suntrap. Presented in good condition, the property has a partially floored attic for storage, a phone line installed and a wired alarm and all furniture and curtains are included in the sale. Nos 17 and 17A Newcastle Park are for sale in separate lots but there is an option to purchase them in a combined lot. No 17 would make a wonderful family home, with a granny flat at 17A. It could also be converted to consultancy rooms (subject to planning ) with ample parking to the front for four cars and with extra room in the bungalow to the rear. This option offers an excellent opportunity to acquire a family home with the additional extra rental income asset to the rear. Situated at the end of a cul-de-sac on a substantial corner site, this four bed detached house is in need of modernisation but is presented in good order. The rear garden offers a huge amount of space with well over 20 metres in depth. Moyola Park is just across from NUIG, is well serviced by local amenities, and within close proximity of Galway city centre. An excellent three bed two storey detached house overlooking communal green space. Presented in good condition the property would be an ideal first time buyer home or could equally be attractive as an investment property. Close proximity to Galway city centre and NUIG. A wonderful two bed top floor apartment within moments of Salthill and just a short walk to Galway city centre. The south facing balcony has wonderful panoramic views of Galway Bay, Salthill Promenade, and the Clare hills. Detached four bed house offers with ample living space throughout. In need of modernisation, but presented in good condition and overlooks the large green area. Off street parking at the front and an excellent garden at the rear. Close proximity to UHG and Galway city centre. Semidetached two storey property presented in good condition and has a generous rear garden. Excellently serviced by local amenities and services, is within walking distance of Salthill Promenade, as well as Galway city centre and vibrant West End. Perfectly appealing as an investment property. Semidetached three bed house in a very central location, with a long rear yard and only minutes from Eyre Square. A wonderful location for someone looking for the luxury of being walking distance from everything Galway city has to offer. Beautiful four bed detached bungalow on site of approximately 1 acre. Located off the R446 and L3104 and well situated not far from Athenry town with a host of local amenities which are found within easy reach. Offers an excellent internal sizable layout. Excellent third floor two bed apartment within 1.2km of Eyre Square and close to NUIG, UHG, and Terryland Retail Park. Purpose built student complex of houses and apartments, this property would prove to be the ideal investment opportunity, holiday home, or owner occupied residence. Unique detached property built by its present owner’s family in the 1930s. Presented in excellent condition, it is the only detached property on Henry Street. Tucked away in a very quiet area, free of any traffic and sits right on the canal. The calming sounds of waterfall can be heard from the back bedroom. Walking distance to NUIG and UHG and minutes from the Claddagh and Eyre Square. Excellent investment property, well worth a look. An end of terrace two bed property in a charming neighbourhood of Galway city centre. In need of complete refurbishment and modernisation, this property offers a purchaser the opportunity to create their own quaint home right in the heart of the city. Exceptional three bed townhouse in top class condition. The property is located within the Dun Eibhir development which is located along the coastal route between Galway city and Spiddal. The property is currently rented and can be sold with vacant possession. This is an excellent investment, starter or holiday home within moments of Furbo Beach. Two two-bed penthouse apartments each measuring approximately 800sq ft. Stunning views over Galway Bay and the surrounding coastline from a rooftop decked area. Both apartments are currently rented and can be sold with or without vacant possession. Auction streams live from 12 noon on Friday on www.odonnjoyce.com/auction For further information on these or any of the properties for sale, contact the sales team at O’Donnellan & Joyce auctioneers, 5 Mary Street, Galway, on 091 564 212, [email protected] .